This section introduces changes to the UNIX-level layers in OS X v10.6. Aggressive caching is an important technique in maximizing application performance. However, when caching demands exceed available memory, the system must free up memory as necessary to handle new demands. Typically, this means paging cached data to and from relatively slow storage devices, sometimes even resulting in systemwide performance degradation. Your application should avoid potential paging overhead by actively managing its data caches, releasing them as soon as it no longer needs the cached data. In the wider system context, your application can now also help by creating caches that the operating system can simply purge on a priority basis as memory pressure necessitates. OS X v10.6 includes the low-level libcache and framework-level NSCache APIs to create these purgeable caches. The libcache API is a low-level purgeable caching API. This API uses callbacks and other concepts that should be familiar to UNIX programmers. comparisons, retain/release, and so on. Note: The above example includes two callbacks specific to the data type: the key retain callback (key_retain_cb) and the value release callback (value_release_cb). The remaining callbacks are standard callbacks provided in the header file cache_callbacks.h. When your application needs to obtain potentially cached data, it must first check to see whether the cached data exists and is still valid. It does this by calling cache_get_and_retain. If the cache_get_and_retain operation succeeds, the cached region is still available and your application can use the cached data. // Do something with the value now stored in "data". You can learn more about the UNIX-level API in libcache Reference. OS X v10.6 provides support for block objects in C, C++, and Objective-C. A block object (in casual parlance often referred to simply as a block) is a mechanism you can use to create an ad hoc function body as an expression. In other languages and environments, a block object is sometimes called a closure or a lambda. You use block objects when you need to create a reusable segment of code but defining a function or method might be a heavyweight (and perhaps inflexible) solution—for example, if you want to write callbacks with custom data or if you want to perform an operation on all the items in a collection. For details, see Blocks Programming Topics. Grand Central Dispatch (GCD) is a new BSD-level infrastructure. With this simple and efficient API, application developers can achieve concurrency by avoiding blocking APIs, contended memory access, and synchronization with locking and explicit thread management. It provides a POSIX-layer task-queuing API and a dispatch source API for handling events. The GCD queue API provides dispatch queues from which threads take tasks to be executed. Because the threads are managed by GCD, OS X can optimize the number of threads based upon available memory, number of currently active CPU cores, and so on. This shifts a great deal of the burden of power and resource management to the operating system itself, freeing your application to focus on the actual work to be accomplished. To provide greater control over concurrency, GCD provides two different types of queues: concurrent queues and serial queues. Both types are FIFO, but although a task in a serial queue waits until the previous task finishes executing, the task at the front of a concurrent queue can start executing as soon as a thread becomes available. A dispatch group allows your application to block a thread until one or more tasks finish executing. For example, after dispatching several tasks to compute some data, you might use a group to wait on those tasks and then process the results when they are done. You can use a dispatch semaphore to regulate the number of tasks allowed to simultaneously access a finite resource. For example, each application is given a limited number of file descriptors to use. If you have a task that processes large numbers of files, you do not want to open so many files at one time that you run out of file descriptors. Instead, you can use a semaphore to limit the number of file descriptors in use at any one time by your file-processing code. A dispatch semaphore works like a traditional semaphore, except that when the resource is available, it takes less time to acquire a dispatch semaphore. The reason is that Grand Central Dispatch does not call into the kernel for this particular case. It calls into the kernel only when the resource is not available and the system needs to park your thread until the semaphore is signaled. For more information about GCD, read Concurrency Programming Guide and Grand Central Dispatch (GCD) Reference. The kernel can better support large memory configurations. Many kernel data structures such as the page table get larger as physical RAM increases. When using a 32-bit kernel with more than 32 GB of physical RAM, these data structures can consume an unmanageably large portion of the 4 GB kernel address space. By moving to a 64-bit kernel, the 4 GB kernel address space limitation is eliminated, and thus these data structures can grow as needed. The maximum size of the buffer cache is increased, potentially improving I/O performance. A 32-bit kernel is limited in its ability to cache disk accesses because of the 4 GB kernel address space limit. With a 64-bit kernel, the buffer cache can grow as needed to maximize the use of otherwise unused RAM. Performance is improved when working with specialized networking hardware that emulates memory mapping across a wire or with multiple video cards containing over 2 GB of video RAM. With a 32-bit kernel, if the combined physical address space (video RAM, for example) of all of your devices exceeds about 1.5 GB, it is impossible to map them fully into a 32-bit kernel address space at the same time. To work around this limitation, driver writers must map smaller apertures of that physical address space into the kernel’s address space. When such a driver needs to write to or read from an unmapped address on the device, it must unmap an existing region, then map in the new region. Depending on how the mappings are managed, this extra process may cause a performance penalty, particularly for clients that exhibit low locality of reference. With a 64-bit kernel, the entire device can be mapped into the kernel’s address space at once. This improves performance by removing the extra overhead of mapping and unmapping regions of memory. It also removes the burden of managing these mappings in your driver code, thus making the drivers simpler and less likely to generate panics by unmapping the wrong memory at the wrong time. If you see any of these potential problems, either change the code so that they never occur, change the padding of data structures (or add unions) so that fields after size-variant types do not change positions, or use magic numbers to support different versions of data structures for 32-bit and 64-bit code and provide translation routines to convert between them. The document 64-Bit Transition Guide describes things to look for when checking your code and provides helpful techniques for updating your code to be 64-bit clean. Only KPI symbol sets are available. The legacy com.apple.kernel. * symbol sets are not exported for 64-bit KEXTs. The clock_get_uptime operation is not available (use mach_absolute_time instead). Various data structures associated with time calls have changed to allow larger time values. IOCreateThread and IOExitThread are not available. The function kernel_thread is not available. Use kernel_thread_start instead. The kextload tool now exclusively loads kernel extensions. Additional KEXT management debugging functionality that used to be in kextload is now in the kextutil tool. Many functions in com.apple.unsupported are unavailable. Consult the reference documentation and headers for further details. These changes apply only to the x86_64 portion of your universal KEXT binary, not to existing i386 or ppc code. In addition, kernel extension property lists now support architecture-specific properties to allow you to specify different property values for 64-bit versions of your extension. For example, you might specify the property key OSBundleLibraries_x86_64 to specify a different value for the OSBundleLibraries key for the x86_64 architecture. Note: Architecture-specific property variants are supported only for properties that begin with IO or OS. These property variants are not supported for CFBundle properties or any Apple-reserved properties. To improve the user experience in OS X v10.6, API improvements help your application contribute to shorter shutdown times. To support improved shutdown, your application needs to mark itself as “dirty” or “clean,” depending on whether it has unsaved changes and needs to do work before quitting, or can be terminated without further notice. When the system shuts down, clean applications are terminated (via SIGKILL) without further interaction. You support improved shutdown in your application by calling the enableSuddenTermination and disableSuddenTermination methods in NSProcessInfo. These are intended to be used as paired calls. Call disableSuddenTermination when you have work that must be done before quitting, and enableSuddenTermination when that work is done. This essentially launches your application with a call to enableSuddenTermination. Make calls to disableSuddenTermination when there is work that must be done before quitting, such as when you begin an export operation, and make subsequent calls to enableSuddenTermination when the work is complete. Note that even though these calls are in balanced pairs, they can be called on separate threads. For example, you can can disable sudden termination when you schedule an export operation on a background thread, and enable sudden termination when the operation ends, without affecting a foreground process that disables sudden termination when the user begins editing and enables it when the user saves his or her work. Sudden termination is not enabled until all calls to disable it have been balanced by calls to enable it. For many kinds of work, you do not have to disable sudden termination explicitly. The operating system automatically disables sudden termination if an NSDocument object has unsaved changes, for example, or when NSUserDefaults or CFPreferences has been changed but not synchronized. Your application should avoid data management and cleanup code that runs lazily during termination. You should carefully examine your code for work you do in applicationWillTerminate, overrides of [NSApplication terminate:], and [NSWindow close]. Other places to consider are in the handlers atexit() and cxa_atexit(), and in C and C++ destructors. You should plan to rework such code as soon as possible; in the meantime, you must disable sudden termination to ensure that it will execute. You generally do not need to perform any deallocations before quitting. The operating system can be relied on to do this for you when it terminates your application. For more information, see NSProcessInfo Class Reference. For agents and daemons, there is a UNIX-level function in vproc.h (vproc_transaction_begin), which corresponds to disableSuddenTermination, and another function (vproc_transaction_end), which corresponds to enableSuddenTermination. Note: When using the vproc API, note that setting the vproc_t parameter to NULL identifies the process as self. You should refactor your code as necessary to avoid executing maintenance code lazily in certain places: your SIGTERM handler, as well as any atexit(), cxa_atexit() handlers, module finalizers, and C++ destructors. In the meantime, you must add begin and end transaction calls where appropriate to ensure that any such code continues to run. 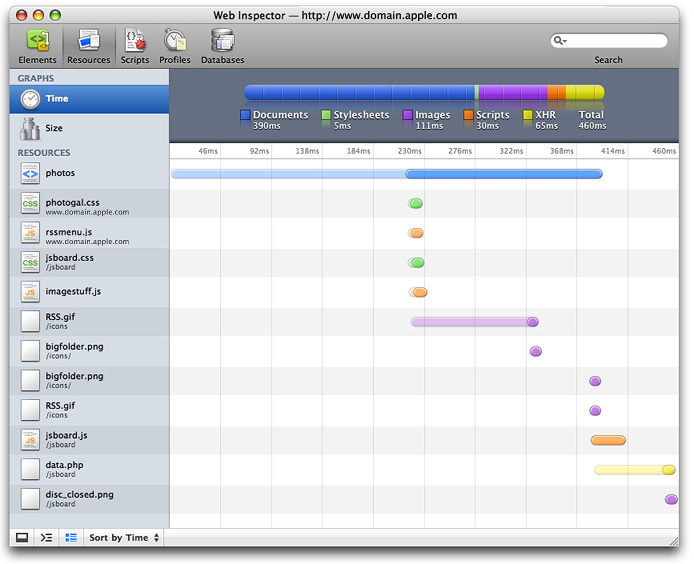 This section introduces changes to the framework-level layers in OS X v10.6. Some of the more salient Cocoa enhancements are listed here. Some are described briefly later in this section; each is described in detail in the relevant ADC Reference Library documents. Enhancements and performance improvements to NSOperation and NSOperationQueue. New NSBlockOperation class for block-based operations. See Concurrency with Operation Objects. NSURL: Much more complete support for file properties, along with caching for improved performance and path utilities for managing file names. See File-System Efficiency. New NSPurgeableData data class to implement the NSDiscardableContent protocol. New NSCache class. See The NSCache API. APIs and support for sudden termination. See Improved Shutdown . Core Data integration with Spotlight. See Core Data Spotlight Integration Guide. 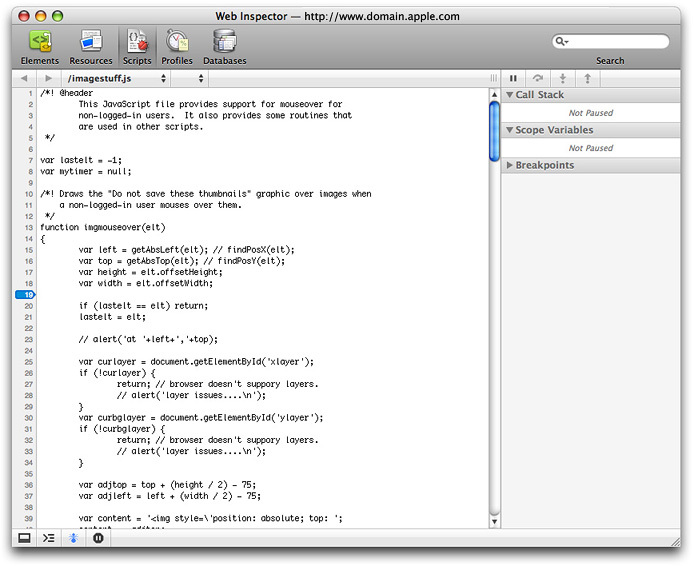 In addition to the UNIX-level libcache API described above, OS X v10.6 also provides an Objective-C API, NSCache. This API is conceptually similar to the libcache API, but NSCache also offers autoremoval policies to ensure that the memory footprint of the cache doesn't get too large. To use the API, first create a new NSCache object. Next, add new objects for keys using setObject:forKey: or setObject:forKey:cost:. When you want to retrieve the object again, call objectForKey:. If the object is still available in the cache, you will get it back. Otherwise, you must recreate the object and its contents. You can remove an item from the cache by calling removeObjectForKey: or clear the cache by calling removeAllObjects. If desired, you can also specify advisory limits for the maximum number of items in the cache and the maximum total cost of items in the cache. You can also add your own delegate conforming to the NSCacheDelegate protocol. If you do, its cache:willEvictObject: method will be called before an object is evicted to allow you to clean up as needed. For more information, see Caching and Purgeable Memory. The NSCache API is not the only way to minimize the memory footprint of your application. Cocoa also provides the NSPurgeableData class to help your application use memory efficiently and possibly improve performance. Paging is a time-intensive process. With memory marked as purgeable, the system avoids the expense of paging by simply reclaiming that memory. The tradeoff, of course, is that the data is discarded, and if your application needs that data later, it must recompute it. The NSPurgeableData class does not have to be used in conjunction with NSCache; you can use it independently to get purging behavior. A Cocoa operation is an Objective-C–based object designed to help you improve the level of concurrency in your application. You use it to encapsulate a task that you want executed asynchronously. You can submit operation objects to a queue and let the corresponding work be performed asynchronously on one or more separate threads. The Foundation framework in OS X version 10.6 includes a new class, NSBlockOperation, for executing one or more blocks concurrently. Because it can execute more than one block, a block operation object operates using a group semantic; only when all of the associated blocks have finished executing is the operation itself considered finished. For more information about concurrency via operation objects, read Concurrency Programming Guide. OS X v10.6 maximizes file-system efficiency by using URLs to consolidate access to files, file properties, and directory contents. This allows a single mechanism to be used for accessing all files, file properties, and directories and eliminates internal translations between paths, URLs, and FSRefs. To maximize file efficiency in your application, you should use file: scheme URLs as file accessors, instead of using FSRefs, FSSpecs, File Manager routines, or POSIX file routines (stat, lstat, getattrlist, chmod, setattrlist, chflag) to access file properties or directory contents. In this way, your file-system calls can be processed with a minimum of format translations. These methods work just as the corresponding methods that accept file system paths. File properties have been added to CFURL and NSURL to provide the same flexibility and services that formerly required use of FSRef. Your application can identify properties using the familiar mechanism of keys and values, where file properties are identified by keys (string constants) that are paired with values (CFTypes for CFURL and objects for NSURL). For example, to obtain the modification date of a file using NSURL, you could ask for the property associated with the key NSURLContentModificationDateKey. For the file size, there is NSURLFileSizeKey. For the icon normally associated with this type of file, there is NSURLEffectiveIconKey. To obtain the file’s parent directory, there is NSURLParentDirectoryURLKey. For the available file space on the parent volume, use NSURLVolumeAvailableCapacityKey. There are over 40 file, directory, and volume properties that can be read this way. And because OS X v10.6 has consolidated the file property API, it can use intelligent caching for file properties, often allowing you to obtain multiple properties without additional file I/O. For the most part, these methods replace the file properties API in the File Manager, NSFileManager, and POSIX file access calls (stat, lstat, getattrlist, chmod, setattrlist, chflag). In addition, you can now create two kinds of file: scheme URLs—path-based and file-ID based—so you no longer need to rely on paths when files are moving around or directories have been renamed. File-ID based URLs contain the volume ID and file ID of the target, and can be used to specify a file or directory (or a bundle, which is a directory by another name). The CFURLCreateFileIDURL function converts a path-based URL to a file-ID URL, and CFURLCreateFileURL converts a file-ID URL to a path-based URL. Generally speaking, you can use a file-ID URL wherever you can use a file: scheme URL. There is also a new Bookmark API which creates a data object (NSData) or CFDataRef (CFURL) containing a representation of a URL (a CFURLRef or an NSURL). This provides the services formerly supplied by aliases, and replaces the Alias Manager. Bookmark data can be stored persistently—in your application’s files or database, for example—and later resolved to create a URL locating the bookmarked file, even if that file has moved. The API also supports fetching resource properties directly from bookmark data. See CFURL Reference and NSURL Class Reference for additional details. OS X v10.6 also offers efficient partial decoding of image files, providing support for your application to access subrectangles of images for tiling. Clients of NSImage, CIImage and CGImageRef generally don’t need to make code changes to benefit from the improved imaging pipeline. If you’re using Icon Services to get icons, you should switch to NSWorkspace. If your application needs to play back iPod media, including content purchased through iTunes, you can take advantage of a new, lightweight, and more efficient media playback capability provided in QuickTime X and OS X v10.6. You gain access to these media services through the QTKit framework. The new QuickTime X media services offered in OS X v10.6 allow applications to perform asynchronous movie opening, thus avoiding operations from getting blocked for lengthy periods of time when a media file is opened. Note, however, that asynchronous opening is not available for all media types that QTKit supports. Asynchronous loading can also be cancelled at any time. In OS X v10.6, maximum backward compatibility with existing QTKit client applications is also preserved. This is accomplished by minimizing the number of changes made to the existing QTKit API and by defaulting to completely backward-compatible behaviors. For example, clients of QTKit must explicitly grant QTKit permission to try to use the new private media services for a particular media file, by including a new attribute in the list of attributes passed to -[QTMovie initWithAttributes:error:]. The first attribute indicates whether a QTMovie object must be opened asynchronously. Set this attribute to YES to indicate that all operations necessary to open the movie file (or other container) and create a valid QTMovie object must occur asynchronously. That is, the methods movieWithAttributes:error: and initWithAttributes:error: will return almost immediately, performing any lengthy operations on another thread. Your application can monitor the movie load state to determine the progress of those operations. The second attribute indicates whether a QTMovie object will be used only for playback and not for editing or exporting. Set this attribute to YES to indicate that you intend to use movie playback methods, such as play or stop, or corresponding movie view methods such as play: or pause: in order to control the movie, but do not intend to use other methods that edit, export, or in any way modify the movie. Specifying that you need playback services only may allow QTMovie to use more efficient code paths for some media files. Because the attributes dictionary contains a key-value pair with the QTMovieOpenForPlaybackAttribute key and the value YES, QTKit uses the new media services provided in QuickTime X, if possible, to play back the media content in the selected file. OS X v10.6 enables your application to leverage not only multiple CPUs and multiple cores, but the high-performance parallel processing power of GPUs built into many systems. For many applications, this can result in a significant speed-up. Applications can make use of this new capability by calling the OpenCL (Open Computing Library) framework, an Apple-proposed open standard for parallel data computation across GPUs and CPUs. OpenCL provides an abstraction layer so that you can write your code once and it can then run on any hardware that supports the OpenCL standard. Before OpenCL it was possible to write general-purpose applications that ran on GPUs, but you had to translate your calculations into vector arithmetic and write your code in a different proprietary language for each compute device. The OpenCL language is optimized for execution on graphics processors without being tied to any particular hardware or architecture. It is a general-purpose computer language, not specifically a graphics language. It results in the largest performance gains when used for data-parallel processing of large data sets. There are many applications that are ideal for acceleration using OpenCL, such as signal processing, image manipulation, or finite element modeling. The OpenCL language has a rich vocabulary of vector and scalar operators and the ability to operate on multidimensional arrays in parallel. OpenCL programming involves writing compute kernels in the OpenCL-C language, and calling OpenCL framework APIs to set up the context in which the kernels run and to enqueue the kernels for execution. Before an OpenCL compute kernel can run on a particular compute device, the kernel must be compiled into binary code specific to that device. Therefore, to make OpenCL programs portable, the OpenCL compiler and runtime are included in the OpenCL framework and the kernels can be compiled dynamically at runtime. After the program is installed on a system, application load time can be minimized by compiling the program for that system and then saving and running the compiled version in subsequent invocations of the application. OpenCL routines can be linked to and called as C functions from Cocoa, C, or C++ applications. Multiple instances of a compute kernel can be run in parallel on one or more compute units, such as GPU or CPU cores. OpenCL allows you to query the current device to determine how many instances of a kernel can be executed in parallel, for optimization on the fly. OpenCL syntax makes it easy to describe problems in terms of multi-dimensional arrays, often the most natural way to design a program. Multiple kernels can be linked together into larger OpenCL programs. To obtain an overview, a description of the process of writing an OpenCL program, and code samples, see OpenCL Programming Guide for Mac. In OS X v10.6, a plug-in must match its host application in terms of both processor architecture and address width. Applications and other executables that ship as part of OS X are being transitioned to 64-bit-capable executables. If you are writing plug-ins for these 64-bit-capable applications (screen savers, for example), your code must be made 64-bit-native in OS X v10.6 or it will not work on 64-bit-capable Macs. If you are writing plug-ins that are loaded by Apple-authored applications or daemons, you should immediately start transitioning your plug-ins to add an x86_64 version to the universal binaries. Plug-ins that are only two-way (32-bit) universal will not be loaded by 64-bit capable applications in OS X v10.6 and later. One current exception is the System Preferences application, which automatically relaunches itself in 32-bit mode if a user selects a legacy 32-bit preference pane. For an optimal user experience, however, you should still update your preference panes to contain an x86_64 version as soon as possible. Important: If the host application is built to run garbage-collected, the corresponding build of the plug-in must have garbage collection enabled. In the GCC 4.2 Code Generation section of the project settings in Xcode, use the Objective-C Garbage Collection pop-up menu to select "Supported [-fobjc-gc]". For binary compatibility reasons, Automator, screen savers, and System Preferences are currently built to run garbage-collected in 64-bit form but not in 32-bit form. Consequently, any plug-ins for these applications must be built to run garbage-collected in 64-bit form but not in 32-bit form. To learn how to transition your code to 64-bit, read 64-Bit Transition Guide and then read either 64-Bit Transition Guide for Cocoa or 64-Bit Guide for Carbon Developers. The Core Text framework includes a new Font Manager API for registering and activating fonts, managing font descriptors, manipulating font names, and validating font files. For more information, see Core Text Reference Collection. To provide better compile-time type checking, both the AppKit and the Foundation frameworks now use formal protocols for delegate methods. Required protocol methods are marked with @required, where possible. The rest are marked with @optional. Digital images can be displayed on a wide variety of devices, including flat-panel displays, CRTs, and printers. These devices transmit and reflect light with different brightness and intensity, in a nonlinear manner. Including gamma information in the color profile helps the system to reproduce images on different devices with the correct luminance. When gamma information is not available, the system must either guess at the correct gamma correction for the image or use the system default. Images without embedded gamma information look the same when created on Mac OS and displayed on other systems, and vice versa. Images tagged with gamma information look the same as in previous versions of Mac OS (with minor improvements in some cases, because images created in a 2.2 space are no longer converted). OpenGL images and untagged web images have higher contrast. In general, web content displayed will more closely match the luminance seen on other systems, such as PCs running Microsoft Windows. Applications that use system UI elements such as Cocoa controls will see little or no change. However, untagged images that are not part of the system UI appear darker. If your application uses custom UI elements, you may need to adjust their brightness to obtain the desired appearance. It is strongly recommended that your application tag its images with gamma information. A new API has been added to ColorSync to return the gamma value for a given connected display. Programmatically generated images should use the ColorSync framework to automatically output the correct luminance. This section introduces changes to the application-level layers in OS X v10.6. OS X v10.6 includes technology to provide Microsoft Exchange support for Address Book, Mail, and iCal. It uses the Exchange Web Services protocol to provide access to Exchange Server 2007. The querySelector works similarly, but returns only the first matching element. // Perform further selection on each of the resulting elements. For a complete description of this API, see the W3C Selectors API at http://www.w3.org/TR/selectors-api/. The newly revamped Resources pane now shows detailed graphs of the size of each resource and the amount of time spent loading that resource. 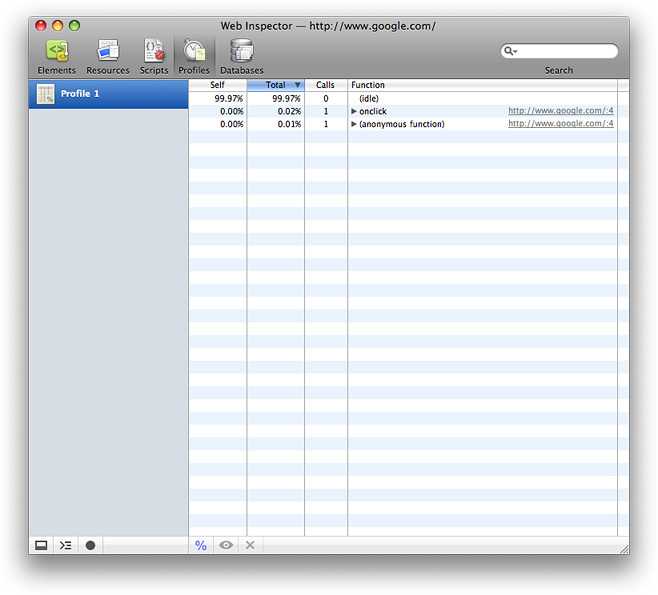 By looking at this pane, you can see at a glance what aspects of your web content dominate the load time of the page. The Scripts pane now provides substantial new debugging functionality. You can pause script execution or set breakpoints to stop automatically, and then step into function calls, step over them, or step out of them. While execution is stopped, you can also examine the values of local and global variables. Table 1 lists the documents describing the API changes that were made in system frameworks for OS X v10.6.